CLR is the exclusive originator of loans made by West Bay. Since 1994, CLR has been a full-service mortgage and finance company dedicated to originating commercial mortgage instruments. CLR has numerous financial arrangements with banks, credit unions, insurance companies, Wall Street lenders, mortgage bankers, and other credit providers through which it arranges loans for its clients. In addition, CLR provides private money financing for bridge and non-institutional loans, as well as other opportunistic funding needs of its clients. CLR maintains a CFL and a BRE license, is 100% owned by Messrs. McBride and Marek, and is an affiliate of West Bay Capital, LLC. CRA is a full-service commercial real estate company which provides a variety of real estate related services, including brokerage (sales and leasing), investment, development, asset management, property management, and consulting. CRA provides and supports these services on numerous property types, including: retail, office, industrial, multi-family, mobile home parks, residential tract developments, golf courses, assisted living facilities, and other special purpose properties. CRA is a division of CLR and is an affiliate of West Bay Capital, LLC. 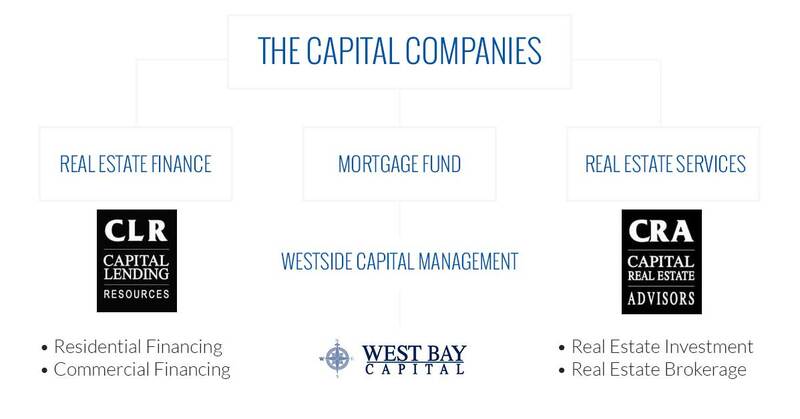 CRA provides commercial real estate support services to West Bay Capital, LLC as needed. CRA and CLR’s personnel will provide additional support to the fund manager in the origination and underwriting process for loans funded by West Bay.